Mía is a sloth who lives in Colombia. She would like to drink coffee, like her mother. She would like to be faster. Mía is impatient and starts exploring her surroundings. She encounters different animals: an anteater on a motorbike, a mean armandillo and an even nastier goat. When her adventure comes to an end, Mía has found out that doing things in your pace is fine and she has a sweet boyfriend. The story is exciting, but while reading it, you also get to know more about Colombia: about its culture, the different animals that live there and about coffee. Apart from the story you will find information about these aspects. The book als contains a list of themes that you would want to explore further and discuss in class, like Colombian coffee and the value of friendship. And the fact that it is chill to go slow. A funny, exciting and informative story for students who just started to learn Spanish, on their way to level A1. Fun Spanish easy reader for beginners, ideal for elementary/primary students. Brandon wants a dog. He will do anything to get one. Anything...? Spanish easy reader for absolute beginners at elementary / primary school. 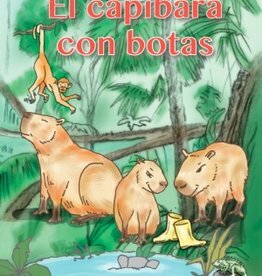 A heart warming story about a capibara in the Amazon Rainforest, who is different from the others. Sheet with 48 fun stickers with smilies and Spanish texts.